Categories for the Options dialogue box are listed on the left, while in the information for each category is displayed on the right after the category has been highlighted. In the screenshot below, the "Getting Started" category is highlighted on the left and is therefore also displayed on the right. This section stores the essential information for your account. Once the information is entered on this screen, Eudora will enter it in the other sections for you. Let's go over what it is asking for. Whatever you type for the name will appear in the From field of the emails you send out. The return address should be your email account. The incoming mail server will be "mail." plus your domain. 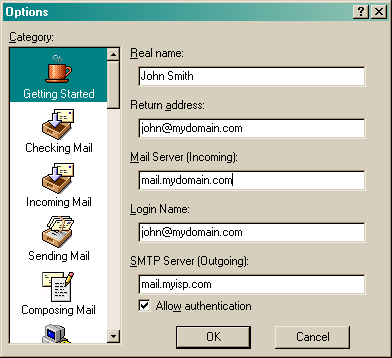 Thus, if I bought email for mydomain.com, my incoming mail server would be mail.mydomain.com. Type your entire email address for the Login Name. The outgoing mail server is mildly tricky. You need to use the server provided by your ISP, the people you use to connect to the Internet. This could be Earthlink, MSN, Prodigy, or any of several others. Type the name for their outgoing mail server in the blank. Then click on the "Checking Mail" category on the left. To continue this tutorial, click "Checking Mail" in the screenshot below.